In the early 2000’s I worked in a global pharmaceuticals company where there was a PMO. I was accountable for a global transformation in my part of the organisation, and because this was part of a major coordinated programme, I had to report on my project to a central PMO. All this did for me was to add a 5-10% ‘tax’ on my time. By this I mean that I spent 1 to 2 days each month writing a report and answering a few questions. But I didn’t get any support in return, in fact I never got any feedback after I had reported my part in the approved format. My project sponsor wasn’t sure what the PMO did either, other than bury his boss under several hundred pages of monthly report, and cost us $1M a year in consulting fees. I recently saw a post on a LinkedIn project management group that explained the role of the PMO. Part of the justification for the PMO included “…project managers aren’t always involved in the benefits-side of projects…”. Also this week I submitted a proposal to a public sector body that was looking for project procurement expertise on a $1.5 billion infrastructure programme. As part of the RFP that I was responding to, they said that they were planning to use a PMCA consultant to oversee the programme. They didn’t say, but they may well already have chosen this consultant. These got me thinking about why do organisations need to add these roles if they have good project managers, who establish good project governance? I see much in common between these approaches – A PM&CA consultant is kind of a PMO for a one-off capital programme, whereas a PMO has a more longer-term role in the client organisation. 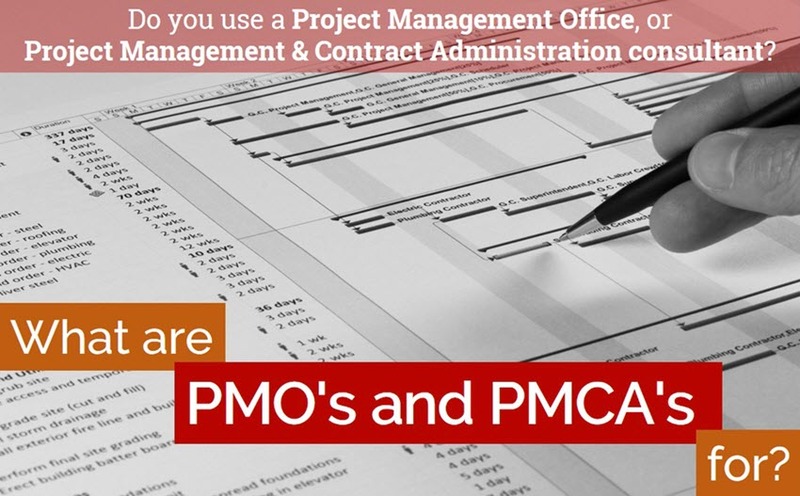 PMCA’s also seem to get more involved in contract management and oversight than most PMOs. But other than that, they seem to carry out a similar role. Now I am not saying that large client organisations don’t need additional specialists to support large project programmes. But I am questioning how they seem to be implemented today, where it seems to me that they just add another functional silo. Back to the LinkedIn article about the PMO. It seemed to be saying that because many project managers see their role as simply achieving time cost and quality targets (rather than business results), then you need to add another body to address the business fit. Anyone who has less than the end-end responsibility, even though the role may be important, it is a work package manager. A project should only have a single project manager. And the same applies to the PM&CA consultant – just because there doesnt seem to be a single person who is the end-end true project manager, does not mean you should add another silo with another partial responsibility. I remember back in the 1990’s that the project management research company IPA, showed the strong correlation between change of project manager and project success (more changes of PM during the project = worse results). Making a different person responsible for each part of the project, is like having four sequential project managers!! What value does adding an extra layer play? It seems to me that this extra layer is there to overcome a lack of ability in either your PM or the client stakeholders on the steering committees. On capex and construction projects, a common reason for this extra layer is simply the amount of effort needed to manage the client-supply chain interface. Projects that use the more common approaches of fixed-price and schedule of rates contracting, can have a significant amount of contract administration. So much so that this can take the majority of the project manager’s time. So in this environment, offloading most of this administrative work to a third party (the PM&CA consultant) might make sense. But there is an alternative to adding this layer (and with it more cost, extra delays in the flow of information and decisions, and greater risk of mistakes). And this is to change how we contract and plan. If your projects use collaborative contracting approaches, such as project alliancing, the quantity of contract administration between supply chain and client should be substantially reduced, as will the need to approve each minor change, and to check and ‘police’ each invoice. This substantially changes the role of the ‘project manager’ from worrying about, and controlling, the contractors, to leading the project team. With alliance projects, the client should also expect the alliance supply partners to provide the business-level reporting often carried out by the PM&CA/PMO. And since the alliance team is selected earlier in the project process, is involved in the definition stage, and is rewarded against client project outcomes, the alliance leadership is much more aware of the project’s business objectives and purpose. Project alliancing helps the project manger to be more forward looking, and allows the team to identify and implement good practice and innovation, much more so than on fixed-price, lump-sum contracts. And all without having a separate body overseeing their detailed activities like a “contract police force”. Even if you have an internal project to transform your project management process and capability, whilst this will require a team to deliver the change, it doesn’t require you to set up a permanent PMO as an extra silo. The “Chief Projects Officer” and their team is there to ensure good project management happens, but not necessarily to be part of doing good project management. That is why it only needs to be a small team. If your organisation has an ongoing capital programme, then the red functions would be mainly staff positions (like a PMO), and if you are involved in less continuous capex investment, they might be outsourced for the duration of the programme (like a PM&CA consultant). Compared to today’s PMOs and PM&CAs, they will be smaller teams, with different skills. I actually included many of these points in my RFP response this week. At the project level, the client was planning to use collaborative contracting – either a project alliance or a slight variation on the theme. But then at the programme level, they planned to employ a separate PM&CA consultant, with a scope of work that seemed to be much more suited to non-collaborative projects. You don’t maximise the benefits from any innovation if you keep the old rules and measures that were needed before the innovation. This would be like moving to email and at the same time requiring most documents to be delivered in physical form with ‘wet signatures’. To get real benefit from any innovation, you need to make sure you throw away (or at least update) the old processes that you put in place to cope before the innovation came along! I don’t hold out much hope for my recent proposal, especially if the client thinks I am criticising their strategy, or if they have already selected an PM&CA consultant. That is the consultant’s dilemma – do what the client asks (so they like you), or suggest how they can achieve more (but risk upsetting them). I think doing the latter is best, but it seems you get less business that way!! This RFP is a great opportunity to support capex project innovation. The client’s programme is a substantial investment in transport infrastructure, schools and hospitals. The improvements that I believe are possible through implementing the ideas of Breakthrough Project Management would mean new assets available sooner, and more value for the limited budget. I hope we get the chance to be involved. Anyway, back to the topic of PMOs and PM&CAs. Have I missed something? Do they have another key role that I have overlooked? * = Between 1985 and 2000, I worked on projects for ICI, which at the time was one of the world’s largest chemical manufacturers. The capital programme was significant, and overall performance was pretty good, and much better than today’s claimed capex project performance benchmarks.